As VP of Corporate Strategy at Twitter, Elad Gil was a key player as company headcount skyrocketed from 90 to 1,500 employees. This wasn’t Elad’s first experience with hyper growth – Google grew headcount 10x during his time as a product manager there – nor the last. He’s also co-founded Color Genomics and invested in and been an adviser to companies like Airbnb, Coinbase, Instacart, Square, Stripe and more. To help codify his learnings throughout those experiences and share the most repeatable frameworks, he’s published the High Growth Handbook, available from Stripe Press on Tuesday, July 17. I hosted Elad on the podcast for a conversation that ranged from the key themes of his new book to scaling a healthy culture and ins and outs of mergers and acquisitions. If you enjoy the it, check out more episodes. You can subscribe on iTunes, stream on Spotify or grab the RSS feed in your player of choice. Before hiring a COO, founders first need to ask themselves whether the function is best served with a single hire or distributed through multiple roles. Re-orgs are a necessary part of growth. Execute them rapidly (within 24 hours if possible) to avoid causing your employees unnecessary anxiety about the future of their jobs. Acquisitions can help fuel growth, but often go awry when the company fails to explicitly instruct their internal teams to step aside so that the new hires can do their jobs. Culture is the set of relationships people in the company have to each other – and the unwritten set of rules they live by – and it’s going to evolve over time. The key is picking the two or three non-negotiables that you plan to maintain. Most growth advice is focused on solving tough problems, but it’s important to remember that being part of a rapidly scaling company is a career experience that only a tiny fraction of employees will ever have, which often leads to accelerated personal growth as well. Adam Risman: Elad, welcome to Inside Intercom. Congratulations on the High Growth Handbook. You’ve seen hyper growth from many angles, be it as an early employee at Google, your time at Twitter, a founder at Color and an angel investor. What are a few of the key points in your career that led you to write about this? Elad Gil: My career has been split between operating and investing. On the operating side, I joined Google when it was around 1,500 people, and I left around two and a half years later when it was 15,000 people. Then I started a company (Mixer Labs) that Twitter bought when Twitter was about 90 people, and then I left two and a half years later when it was 1,500. I stuck around for another year as an advisor, so I really saw extreme growth in both of those cases. I’ve also invested in a lot of companies like Airbnb, Coinbase, Instacart, Stripe, Square, Pinterest, Zenefits and Gusto, and have watched as some of those companies have scaled pretty dramatically. You start to see these common patterns in terms of how things tend to evolve. Founders of breakout companies – just like founders of earlier stage companies – tend to ask more or less the same sets of questions. Obviously, each startup is unique, and the context of a startup matters a lot, but you tend to have the same questions like: “How do I hire general counsel? How do I hire a new type of executive whose function I don’t know about? How do I buy a company for the first time? 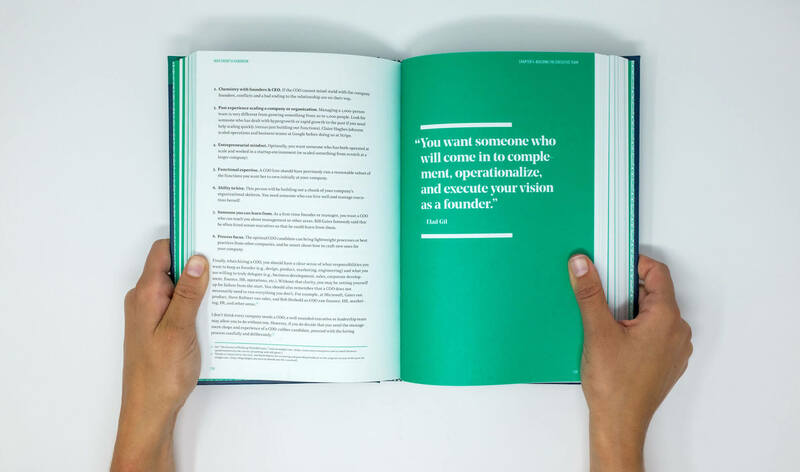 How do I internationalize for the first time?” These are very common questions, and the purpose of this High Growth Handbook is to codify some of those learnings I’ve seen across different companies. Adam: Stripe Press is publishing the book. How did that partnership come about? Elad: It was a bit ad hoc. Stripe had been thinking for a while about either publishing books or reissuing books they’re very excited about. It really started as a conversation with John Collison, one of the co-founders of Stripe. I mentioned I’d been working on this book and that I was originally going to launch it as a website. He got excited about it being one of the first books that Stripe would launch as an imprint. The first Stripe Press book: https://t.co/s4h4PNqjNS. Adam: Whom are you speaking to through the book, and what are you hoping they might do differently as a result of all learnings you’re sharing? Elad: There are three audiences I’m hoping to reach. One is founders. Every founding story is filled with challenges and a lot of effort, so the hope is to try and make life easier for them. The third audience is really just the broader community of people who are interested in technology: it could be business people in other fields, investors or others. Adam: Your message to the employee audience is really enlightening because you’re tackling everything from decisions around future funding, to the evolution of the CEO role, to when you might bring on a COO – all sorts of stuff that reveals what the decision-making process is like behind the scenes. Elad: That’s part of the intention. Originally, I was thinking each chapter should have the employees’ view of what just happened. I decided in the end not to do it, but I do think that people assume a lot about how savvy their executive team is around certain things, and often people are just figuring this stuff out and just trying to do their best. One of my big takeaways – having gone through Google and then Twitter – is to really give the leadership team the benefit of the doubt. In general, people are trying to do the right thing, and sometimes they do, and sometimes they kind of screw it up, but that’s just the nature of something that’s changing so rapidly. Adam: And many CEOs today are first-time CEOs too. Elad: Especially today. It’s interesting how that’s evolved, because up until Facebook, you’d always hire in a professional CEO to run the company. Obviously, with Facebook, Sheryl Sandberg came in as COO, and that shifted the whole conversation around founders continuing to run the companies and COOs coming onboard. I think that’s been a 90% good trend, but there are maybe 10% of cases where the founders really shouldn’t be running the company anymore, and they don’t have the self-awareness to realize it. I do think it’s been a net positive though. Adam: What should a CEO consider when making a complementary hire like a COO? Elad: The first question is whether you want to stay on as CEO or not. Reid Hoffman has a really great post about his own decision of not being CEO at LinkedIn and how he found somebody who he viewed almost a surrogate founder. I similarly stepped down from Color, the company I started, about four years in. Adam: I was curious if you were speaking to your past self when you were writing that chapter of the book. Elad: A little bit. Ultimately Othman Laraki was the right person to take the company to the next level, but I think that when looking for a COO the first thing you have to consider is whether you really want a COO or you just want to distribute the role across a few people. Because you’re really centralizing a set of functions or a set of responsibilities, but you can also do it in a more distributed way. Secondly, what are you actually looking to offload and why? Often founders who become CEOs of scaling companies start to burn out when they’re consistently doing the things that they hate doing. If you really hate sitting through a dozen sales comp meetings, maybe you should find somebody who can really fulfill that role. Part of the calculus in hiring a COO is to ask, “What do I want them to be doing?” Then there are all sorts of questions around culture fit, complementing working styles, and ultimately, how do you start thinking about working together and partnering with that person – as well as your broader executive team – as CEO? 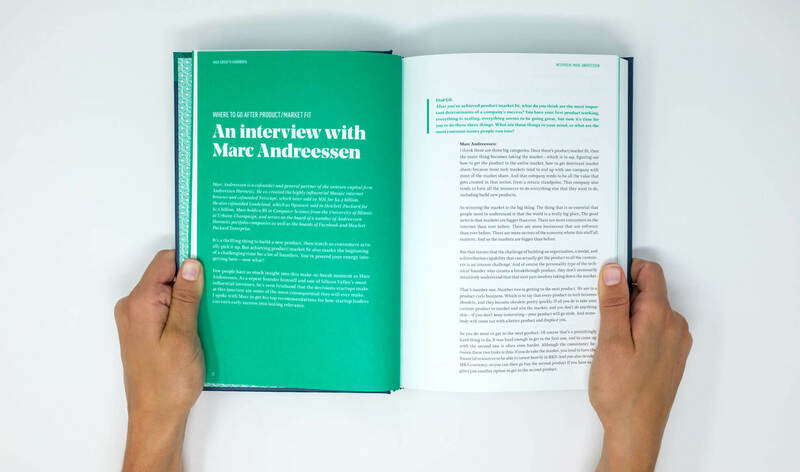 Adam: For the book, you actually interviewed outside sources like Marc Andreessen, Sam Altman at Y Combinator, Claire Hughes Johnson at Stripe about their perspectives on the various topics you tackle in the book. Why did you feel like it was so important to get that outside perspective? Elad: Ultimately, I wanted people who had either built things that scale or been involved with a lot of companies that had to deal with scale as they broke out from a product-market-fit perspective. In some cases, these people had different viewpoint from me. They said the opposite of what my book said, and I thought that was very valuable and healthy, because the only good generic startup advice is that there’s no good generic startup advice. Some of them also had areas of expertise that I didn’t, in terms of some of the functions they were responsible for or the types of markets they were in. That outside experience either reinforced certain points that I agreed with or provided counter perspectives, which I think is important. Adam: What’s an example where an interview subject challenged your point of view that really sticks out? Elad: One example is the conversation I had with Naval Ravikant, who founded AngelList and is one of the smartest people in Silicon Valley. In general, AngelList has been run as a more distributed and decentralized organization than what I’m used to. He had a very different perspective – in part, based on his crypto experiences, in part from AngelList – in terms of how you think about decentralizing teams and other aspects that I hadn’t thought about as deeply. Adam: You joined Google at 1,500 people and left at 15,000. At Twitter there 90 people when you got there, 1,500 when you left. In the book, you say that org structure is really an exercise in pragmatism. What do you mean, and how do you navigate that challenge? Elad: If your company is scaling incredibly rapidly – maybe it’s tripling every year or growing headcount at an enormous rate – every 6 to 12 months you’re literally at a different company, because most of the people are new. The processes are probably new. The scale at which you’re operating is new, which means the way you communicate is different. You have to adapt to that, which means frequent re-orgs. Initially, those re-orgs will be at the executive level, and then as certain executive leaders settle down, the re-orgs start to shift into the functional divisions, because suddenly you know who the leadership team is, but you’re starting a new division for some international thing or a new product, and you have to shift how product and engineering and sales are aligned against those things. So, you start to see these shifts in organizational structure. When you’re trying to decide who’s going to run what, there are a few core considerations you need to keep in mind. The first one is where do you want tie-breaking to happen? In other words, if you have an engineering team and a design team and a product team, they’re going to disagree about all sorts of stuff, and that’s a very natural tension. That should happen. But if they take it too far, it’s bad. So you have to ask, “How do I want decisions to be made?” For example, between those three orgs, if you want product and design to sort things out between themselves, and not have that be escalated to the CEO very much, then you probably want both of those functions to report in to one person. The other more pragmatic aspect is to realize that ultimately, there’s no single correct org structure. There are trade-offs. Do you have a COO or not? What functions does your COO own, and what functions does your CFO own? For example, at Twitter, the general counsel at the time, Alexander Macgillivray, at different times owned mergers and acquisitions, trust and safety, legal and a variety of different areas. He picked those areas up because he was a talented executive who could manage teams. He didn’t have the functional expertise, but while we hired in somebody to take over one of these functions, he was the person who was responsible for it. That was truly just a pragmatic call of who had bandwidth to do it. Often you’ll find that when a re-org happens, it’s happening because somebody has the bandwidth to help, or something suddenly becomes very important and so somebody gets assigned to it. It doesn’t necessarily mean it’s going to stay that way forever. It may not be the long-term right choice, but it might just be the pragmatic short-term right choice. Adam: How do you communicate those changes to the wider team? The impetus behind some of these changes can easily get lost in translation. Elad: Sometimes you want to communicate that somebody’s in an interim position, for example, and just make that explicit by saying, “We needed to launch in this new market, and therefore this person is going to own it for a while until we find somebody.” Sometimes you don’t want to do that, because it may also be very disempowering for that executive. If they’re just the interim placeholder, maybe people won’t listen to them as much, or maybe they shouldn’t be making certain hires. It can create a much harder role for that individual. The key is trying to sort out that fine balance of being as transparent as possible, but also realizing that even within the decisions being made, there’s some flexibility and uncertainty. Maybe the salesperson who’s opening up Latin America has been told, “If you do well, you’ll keep it. If you don’t do well, it’ll go to somebody else.” That’s okay, but you may not want to communicate to the whole company that this person is on the line. Adam: When you know these things are inevitably going to change again frequently, how do you measure the success of a re-org? Elad: One is the degree to which people churn out. Are people leaving the company? Are they unhappy? You can measure employee happiness in a variety of ways. Part of it is just how people react to the changes. A lot of the success of a re-org is also driven by how quickly you do it. One of the mistakes people make when they do re-orgs is they take a long time. They pre-announce them and say, “Over the next three weeks, we’ll be making changes.” Sometimes there are reasons to do that, but in general you want to narrow the window of time down to as short of a window as possible. If you can do a re-org in 24 hours, you should do it in 24 hours, because people get really spun up around uncertainty for themselves: “Who’s going to be my boss? What does it mean? Am I going to like her or not? What’s going to happen to me?” This voice of “me, me, me” starts to become very loud when there’s uncertainty, and it’s understandable why people would be worried. You want to take away that uncertainty as quickly as you can, and that’s why you want to do a re-org quickly. You want to know who’s going to report to whom, and you want to be able to explain those implications to people quickly. Adam: Particularly when you’re starting to scale up, new disciplines begin to come into the mix, be it communications, marketing, people ops, etc. From your experience, are there certain departments you think companies maybe wait too long to get to? Elad: In the book, Marc Andreessen points out that people tend to wait too long to hire an HR person. That’s one example of a crucial function. If you’re very focused on regulatory and compliance as a company, you probably want to hire somebody for that role quite early, relative to other companies. I think Coinbase made their general counsel (or a key compliance person) one of their first five or 10 hires. It can be a little bit contextual and important for some companies to add certain people that wouldn’t be important for others, and then I think there are common threads like HR that people probably add too late in most cases. Adam: Your last title at Twitter was VP of Corporate Strategy. From a business operations perspective, were there new wings there that you were able to incubate? Elad: I ended up working on a few different areas across the company, and some of them were in concert with Ali Rowghani who ended up becoming COO and now runs Y Combinator’s Continuity Fund. In some cases, it was just my team that was doing it. Those included things like certain aspects of internationalization, such as the Japan market. We spent some time working with a recruiting team really scaling up and splitting out roles within recruiting so recruiting could scale. The mergers and acquisitions team worked for me for a while. We bought a few dozen companies while that team reported to me. I also had an emphasis on early types of growth models and growth funnels. In some cases, these things were pre-existing and we just all turbo charged them, and in other cases we helped get some things up and running. Adam: People often forget that a lot of Google products, such as mobile maps and Android, started as acquisitions. What’s your take on if and when a company should consider M&A as its next logical step for growth? Elad: I think the vast majority of companies that are worth a few billion dollars or more are buying too few companies today. I’m actually surprised at the degree to which they’re not buying things. For a period of time when the M&A team worked for me at Twitter, something on the order of 20% or 30% of all new engineering hires were coming through M&A. Most of those were reasonably inexpensive acquisitions where we weren’t paying that much of a premium versus somebody walking in off the street, but in some cases, they filled meaningful holes in product teams. Many founders today, especially if they’re technical, start off being very product-centric. They think coming up with great products drives the primary success of their company, which is true very early on and often true late. But what they don’t necessarily realize is at some point, they shift from being a product-only company to a company that has product and distribution. Really what they should be doing is taking advantage of the fact that they have distribution that other people don’t. They can also either buy or build companies and products and then push them down that distribution channel. That was Microsoft’s strategy in the ’90s with Office as a suite. That was also Google’s strategy, if you look at things like Android and Chrome. That was, to some extent, Facebook’s strategy. That was definitely Oracle’s strategy. Cisco did this ad nauseam and still does it. Adam: You came into Twitter through acquisition. What sticks with you the most from when you were being integrated into the organization? From a cultural perspective maybe, what went smoothly? What was a little rough around the edges? Elad: The acquisition of Mixer Labs by Twitter was really a seminal moment for me. I thought Twitter was an amazing platform by which you could communicate with hundreds of millions of people globally. It had an enormous and amazing developer community, and it was just one of those companies that you’re lucky to be a part of. Companies tend to screw things up in three core areas. First is in the onboarding. How do you actually onboard the people that you’re buying? What are their roles going to be? And how can you make sure people get out of the way? Often, you buy a company but there’s a small internal team that was nascent or semi existent in the parent company – and that team thinks it owns the area you just bought a bunch of people for. So you need to be very explicit with that internal team that they need to get out of the way. The second place where they screw it up is in overthinking the degree to which things need to be integrated early. If you look at some of Google’s best acquisitions, in some cases they integrated immediately, and in some cases they let things like Android run as an independent part of the company. You also saw that, for a while at least, with Facebook giving WhatsApp and Instagram more leeway than other internal groups. Too many companies overthink the degree to which technical integration needs to happen, and they’ll force people to pour it over to their stack, when what they should be doing instead is just distributing the existing thing, and then having a longer-term road map to port it. Maybe it takes two years, and that’s okay. You don’t need to freeze everything and then port. The third place where people tend to screw things up is the way they communicate things internally to their own team around the acquisition. They’ll often pre-announce the size of the acquisition or how much the founders may make of off it, or other information that honestly isn’t anybody’s business except for the people being acquired. Adam: Culture is a central theme of your book. What’s a healthy way that culture should evolve when you’re in hyper growth? Elad: People view culture as too static of a thing, when really it’s always evolving. Culture is the set of relationships that people in the company have to each other – and the unwritten set of rules they live by. And just like any other set of relationships, they’re going to evolve over time. Things are going to change, and the key question is around the handful of things you really care about and want everybody to continue to embody in the context of their work. You should be very explicit with everybody that it’s going to change. But you should also pin down the two or three things you really care about and want to maintain as a consistent thread throughout the life of the company. Adam: More and more, companies are co-located between different countries. How much does culture need to be shared by location, and what can be unique to those places where things are different? Elad: Each location is going to have its own characteristics and its own quirks, and that’s great. But the key thing is, again, what are the two or three things that you really care about that you want to make sure that everybody shares in? For example, if you’re setting up a new office, you want to send one or more people from the existing office who have been there for a long time who can really help sort of almost transplant it. It’s almost like a bacterial culture you use to make yogurt: you want to bring over the original culture and create the new batch. Adam: We’ve talked a lot about the challenges of getting big, but it’s not all bad. What are some things that people should be really excited when they get into this hyper growth stage? Elad: If you’re at one of these breakout companies, you’re working on a product or an area that fundamentally is transformative in one way or the other. The impact you’re having is immense, because things wouldn’t be growing as fast as they were if not. So, you should really savor the fact that you’re really changing the way people are doing something. That’s really important. The second piece is that, from a career perspective for employees, joining a company that’s growing rapidly is the best way to have an accelerated career. If you join early enough you end up building bridges to the founders and the executive team that forms. Then, you’re going to be given all sorts of opportunities, because people will trust you and suddenly they’ll say, “Hey, we have to open our new office in London. Who wants to go?” or “Hey, we need to start a new product. Who can jump in?” You’ll start to get these outside opportunities that normally you wouldn’t get in your career, and you can get a lot more responsibility than you could in any other context. From a founder’s perspective, it’s so rare to catch lightning in a bottle. You’re doing something only a very small number of people will ever be able to do in their life. It’s truly a fraction of a percent of people who get to start a breakout company, and so you should really savor it, despite all the hard moments and all the issues that are inevitable for anything that grows. Adam: Elad, thank you so much for joining us today. Where can our listeners go to get the High Growth Handbook and just keep up with the latest that’s going on with you? Elad: You can get the book on Amazon, and find me I’m on Twitter at @eladgil.